Back at the beginning of the summer, Ashley and Emily from the sewing blog FrancesSuzanne invited me to join in on their their September Showcase. 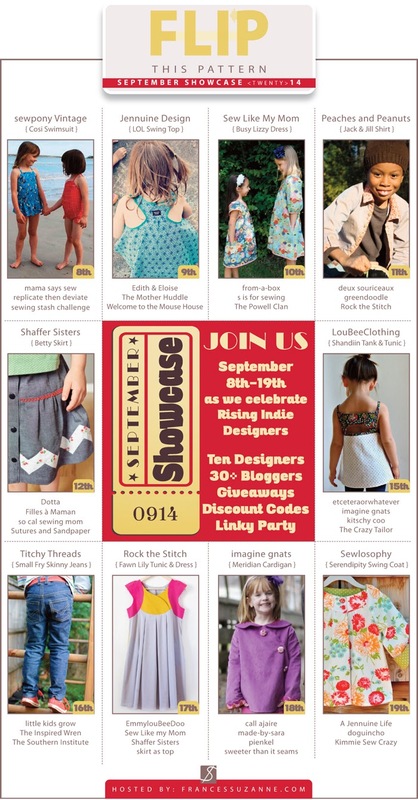 They explained that the September Showcase was to 'show and share' indie designer patterns and no 'flipping' was required. In essence, they were looking for a pattern review. 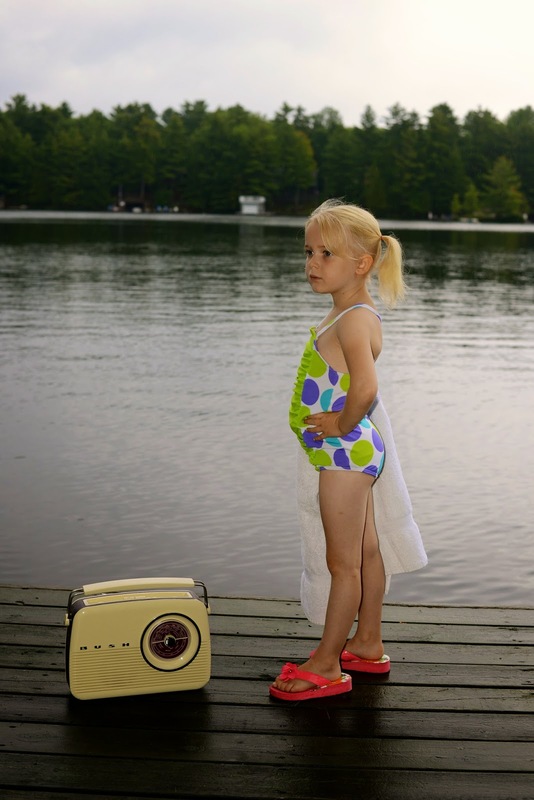 "I can do that," I said to myself, and immediately signed up to 'showcase' the Cosi Swimsuit pattern by Sew Pony. 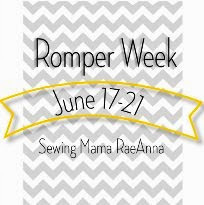 I have seen it made up on a various sewing blogs and loved the vintage look. Before I begin a review of this pattern, I will say that overall it was really easy to construct. A lot of thought went into this pattern. The instructions (27 pages of them) are detailed and include photos so there is no chance to misunderstand what is written plus there is a chart to follow each step for the different views. The first step is to download the pattern and then tape all the pieces together. Usually that task can be somewhat daunting, no, maybe frustrating might be a better word given pages can easily get mixed up and interruptions can make you lose your place not to mention concentration too. With this pattern all the pieces are well marked that if a small wind storm blows the sheets around the room, they are easy to reassemble. Once everything is taped together, then you can look at the 'Views' (page 4) and decide exactly which of the 6 views to make and then refer to the 'Sizing' (page 6) to determine the size to make that will fit your child. Because it's the end of the summer season here in the Great White North, I thought perhaps I should make a size larger than what Miss C is right now, so I went with size 5. Unfortunately I couldn't decide which one to make. I got carried away tracing and cutting out more swimsuits than needed. The first one I made is View D, with the peplum skirt. Included in the pattern are notes and detailed instructions on how to measure the wearer for fabric and elastic and of course, a chart noting the finished sizes vis à vis the child in question. In addition there is a chart noting how much fabric to buy for each view. As you can see in the photo below, there a little extra fabric in the back but again, she will be taller next swimming season and therefore glad of that extra fabric. In the notes are also details for the notions needed such as stretch needles, bar slides for the straps and elastic. 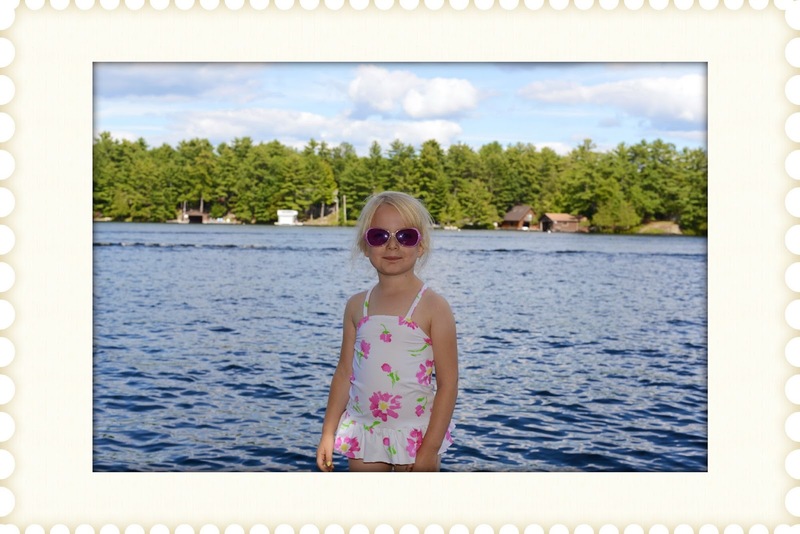 The Cosi swimsuit is vintage inspired which in turn inspired me to make a vintage looking photo of Miss C's summer at the lake. As I mentioned earlier, I got carried away and cut out more swimsuits than necessary. Here's View C minus the leg frill. In the notes are also detailed instructions on swimwear fabric suppliers. I got my swimwear fabric from Fabricland. For each View (example View C above and below) is a chart on page 10 whereby each construction step is numbered and then you refer to the corresponding page with photos. What could be easier? There's a shoal on our shoreline that makes for a perfect granite bench. 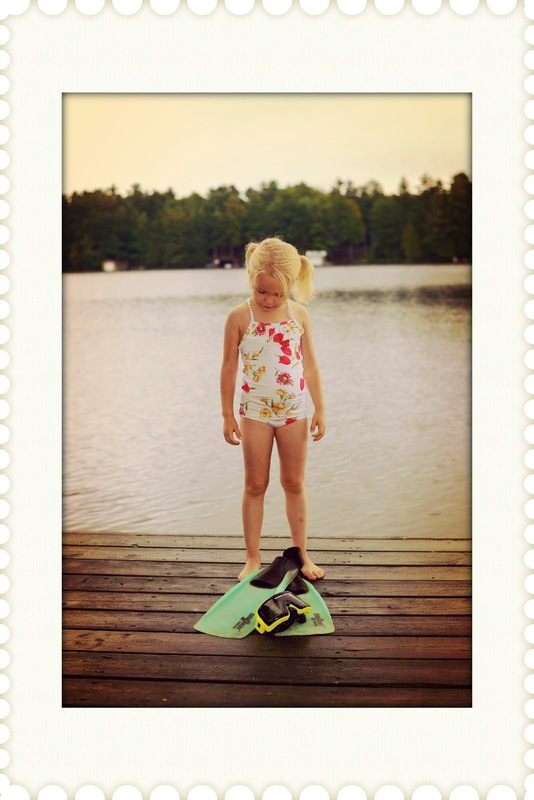 Memories of summer at the lake are the best! 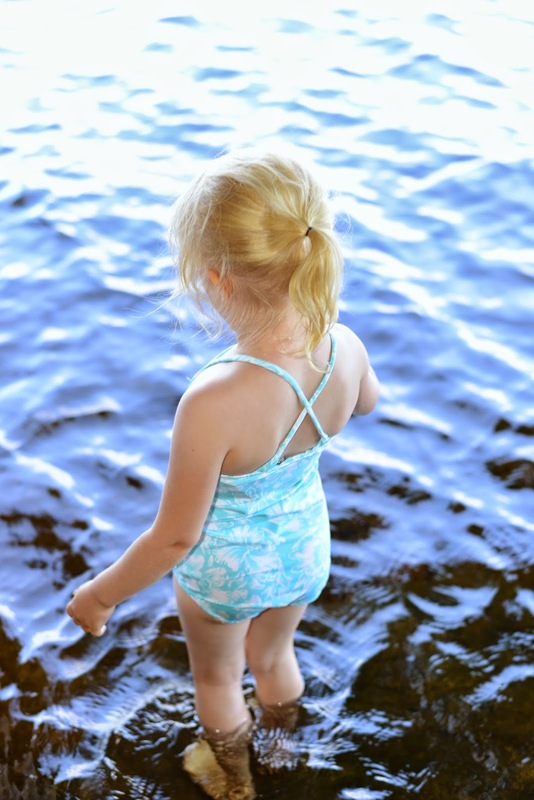 When I was a child, my mother inherited a number of bathing suits from a girl who was 10 or more years older than myself. One of the swimsuits looked exactly like View A, except it was a faded cranberry colour and made from shiny fabric. In the spirit of my vintage swimsuit, I simply had to make View A. With every step of construction, is a matching photo, notes and in some cases notes on the photos so there's no mistaking what to do or how to construct. Both of my daughters' had 'sway' backs when they were little nippers. It must be genetic because so does Miss C hence cause a little extra fabric fullness at the back. Next summer when she's taller, she'll be glad of the extra fabric. 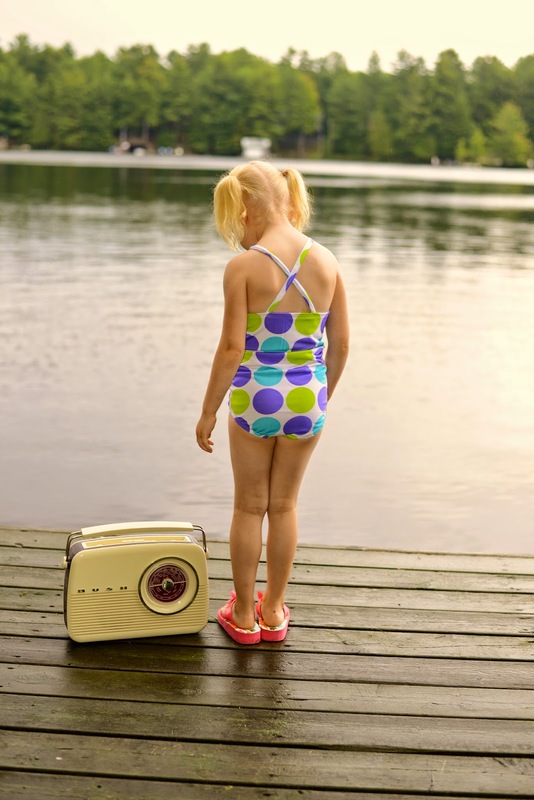 We have a vintage looking radio similar to the radios that everyone had in their cottage way back when. I remember the older kids used to have their radios stretched as far as the plug would go to a window and blast the music down to the dock listening to (mostly static) tunes from Everley Brothers. I'm glad my generation had Led Zepplin. Miss C's mom wasn't crazy about the bar slides for the straps and asked if I could make a straps just plain criss cross, sans the slides. She also liked the peplum skirt on the other suit and wanted another "frill" somewhere. So I added it at the top. In the construction photos and accompanying notes is how to attach elastic. That is something I have problems with depending on the type of elastic. Using clear 'swimsuit' elastic is a bust for me. Even if I use a teflon presser foot, it slides out from under. Cotton elastic works better, except it's somewhat thick. Ideally, thin underwear style elastic would work much better but it's not available at any Fabricland near where I live. Also in the photo/notes are instructions on how to set up your machine for topstitching and how to add lining. 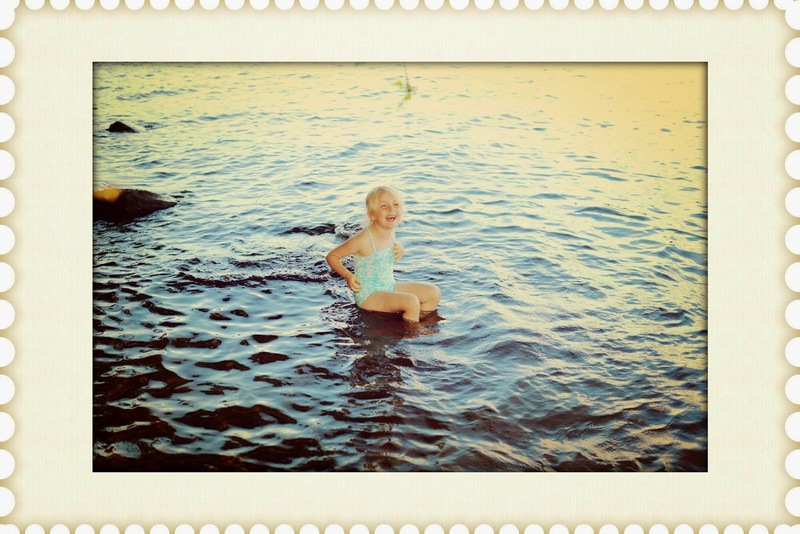 One of my fondest summer memories at the lake is swimming with flippers, snorkel and a mask. There were always so many treasures on the bottom of the lake like shells or someone's sunglasses that fell in the drink. Once I even found a camera. It no longer worked, but hey, it was truly a find for an 8 year old! I simply had to make View G (without the leg frill) bikini style. The bikini bottoms aren't skimpy at all and Miss C said she preferred this style. Too bad swim noodles weren't around when I was a kid. We had to settle for short, hard pieces of foam called flutter boards. They were useless. 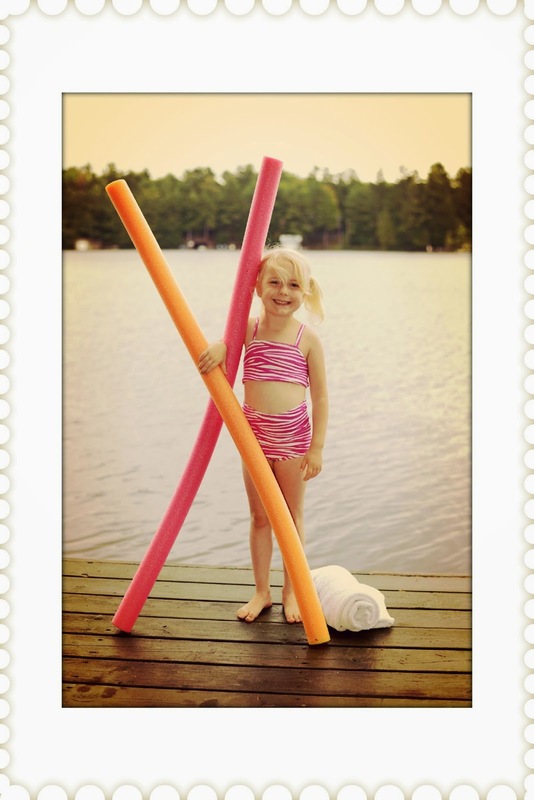 You couldn't sit on them in the water and have fun with them like you can will noodles! 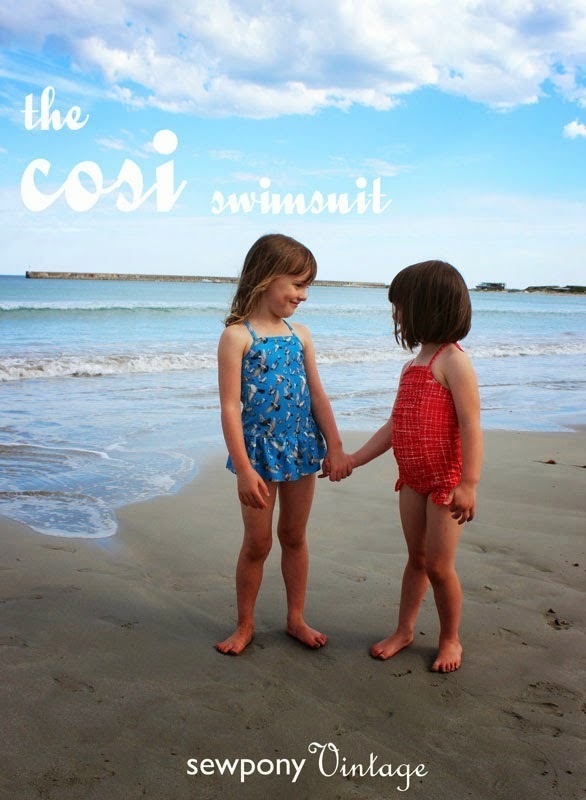 I really liked making these Cosi swimsuits. The instructions certainly were 'hand holding' and therefore I had good results. For someone who has never made a swimsuit before, this is an excellent pattern. My only issue making these swimsuits was with the type of elastic I was using which has nothing to do with the pattern. The pattern is perfect, my elastic...not so much. Since I have made a bathing suit in the past, I knew how to sew in the elastic thanks to this website (click here) but found I needed to practice a little bit more to get it right. As I mentioned before, there are instructions in the pattern on how to apply elastic. I am pleased with all 5 bathing suits and with my experience making the Cosi Swimsuit. 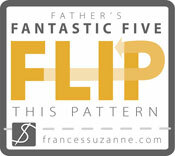 Thank you Suz for a terrific pattern …. it went so swimmingly well! There are many more amazing patterns featured during the September Showcase so check everyones blog post for their review, plus inspiration and bonus, many of the designers will offer a discount on their patterns. And who doesn't like a chance to win? Wow! You really went to town!! I hope your daughter gets lots of wear out of all of these. They look great! Thankyou for your review!! Oh my goodness such lovely versions and pictures! Wow, five suits is impressive! Just a side note..I love to use the cotton swimwear elastic--looks like an ecru color. It acts like regular elastic, but holds up to the chlorine. I just get mine at Hancock fabric, but I'm sure they have it at JoAnns too...Great job! I haven't gotten the courage to try sewing a swimsuit yet, but you've pretty much convinced me it's not difficult at all! Great job and she's one lucky girl! We are still shaking our heads over the fact you did FIVE!! Seriously?? You are hands down the "Queen of Quantity"!! 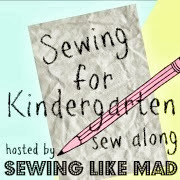 Thanks for sewing along with us in the September Showcase!! fantastic Deb! I've never owned that many great swimsuits at once, what a lucky kid! Oh, wow, I love them all, but I loved the fabric for View A...but cannot pick a favorite of them. I always LOVE seeing and hearing about what you do. Seriously, every girl needs some swimwear options and at least she has hers fully covered! You did such an awesome job! You are one impressive grandmother. 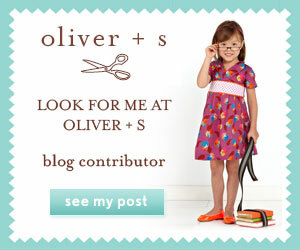 You have a lucky little granddaughter -- though amazing to see how big she is now. 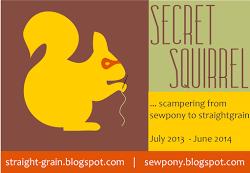 Keep on sewing! Those swimsuits are magnificent. And you made so many! 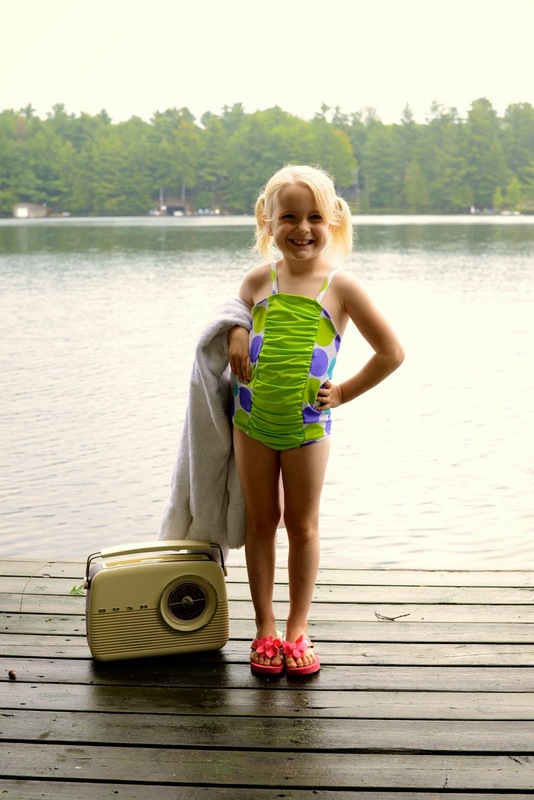 I love the idea of making my daughter's swimsuit. 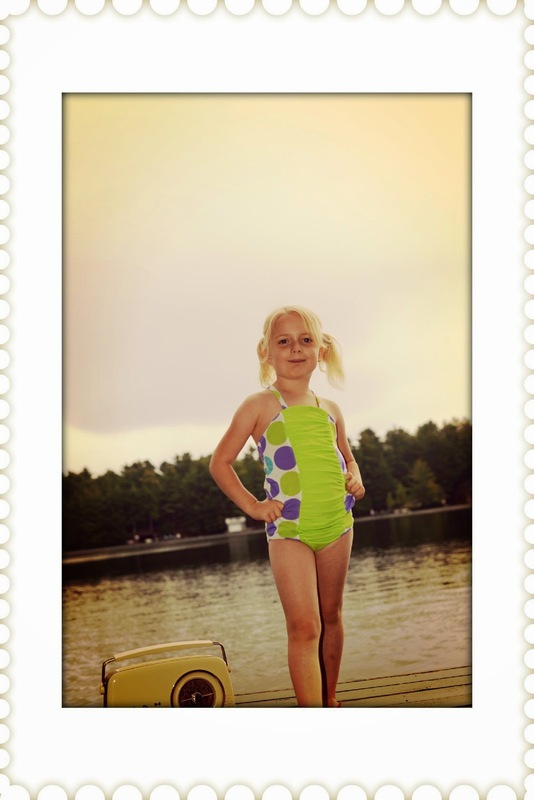 She wore a swimsuit almost everyday this summer so I know if I make one next year it will get used. These are awesome Deb! She's rocking the hand on hip pose, too cute!